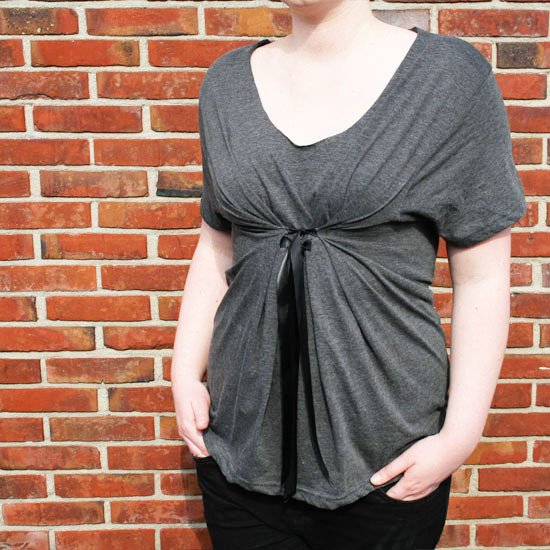 Just Another Static Heart: From Frumpy, to Fabulous! We all have those boring, baggy, old tee-shirts we don't really wear anymore...and we all either donate them, turn them into rags, or simply throw them away. But...why should be so ready to give up on something, just for being a little ugly? Why not turn something frump, into something fabulous! Look at the diagram below, and get your piece of chalk ready! 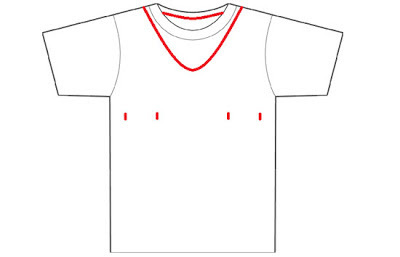 1st: Lightly sketch out where you want your neckline to be. I would suggest only taking off the collar in the back, and not going any lower...otherwise you're tee will become an off the shoulder number. 2nd: Sketch out the lines for the ribbon. You need to have 4 lines, with the inner two right below the middle of your tata's, and the outer two about 4 inches from the inner line. 3rd: Cut the collar, and the ribbon lines. 4th: Now, take your ribbon, and cut it into 4 pieces...with each piece being 10-14 inches. It depends on how long you want the ties to be. 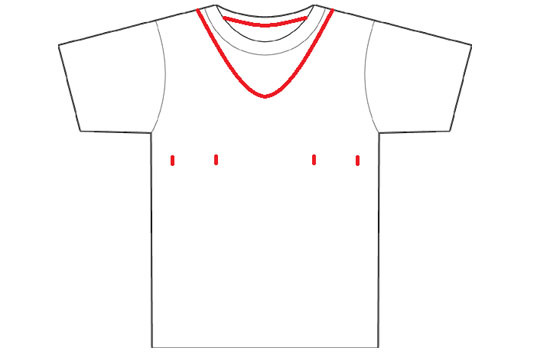 5th: Put one end of the ribbon inside one of the cuts on the chest, and glue it to the t-shirt. Make sure you use glue that will hold through being washed and dried! If you prefer, you can always handsew the ribbons into place, which will only take about 10 minutes. 6th: When the glue is completely dry, you can put the tee-shirt on, and make your two knots. Tie the inner ribbons into a knot, and then the outer ribbons into a pretty bow. Voila! Now you have a super cute new shirt! 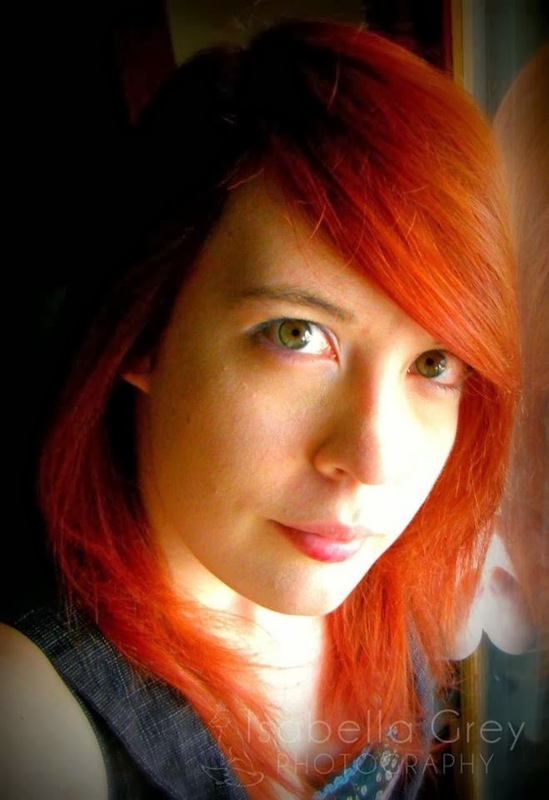 I love your new blog look...it is so beautiful! I cannot WAIT to try this out tomorrow Isabella! Thank you for such a useful and easy tutorial (I don NOT sew and I am excited that I can make something so cute)! I will let you know how it goes. Please do! I can't wait to see what you come up with. Also, thank you! It took me while to come up with this theme today. Hmmm, seems simple and yet elegant =) I usually wear my clothes for about, hmm, 8 years or so, lol. I have some shirts that are so warn out I feel like rag doll wearing them, lol. This does seem like a very creative and stylish way to jazz up those frumpy old clothes. 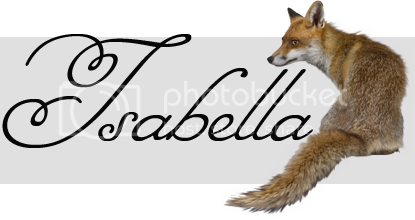 Love the tip Isabella! Simple idea! I think that would make shirts really cute for maternity too. What a great idea, thank you. This is simple enough even I could probably do it! Really cute idea! Love seeing people upcycle something instead of toss it in the trash! Great tutorial! That is cute! Good job! This is such a great idea, not only is it really cute but it will accent your waist nicely! What a truly fantastic idea. This is so cute!!! I would have never guessed that shirt came from an old tshirt! You are so creative! Most of my clothes are frumpy! I have heard this idea around but it just sounded too complicated... you make it look so easy! I will have to give it a try! This is a terrific idea!!! AWESOME! I'm sure I would still mess it up! You're crafty! I love re purposing!! and this is great Thanks!! So creative and a great way to recycle those ugly t-shirts! Great way to Reuse! Sharing! Very cute. Great Idea. Love it.